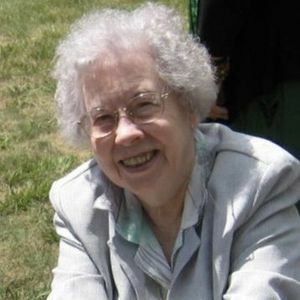 Ella Claire Gilland (nee Hunter) 94 of Olmsted Township, passed away Wednesday, March 20, 2019. She was born November 30, 1924 to parents Charles and Barbara (nee Cameron) Hunter. As a young woman, Ella put herself through college at the University of New Hampshire, graduating with a degree in English. She was the older of the two Hunter girls; she often watched her nieces for her little sister, June, and kept watching them after June died too early. Ella met the love of her life, James at the Winthrop Yacht Club. After getting married in Winthrop, MA, they went to Japan, Hawaii, Virginia (twice), Illinois, and Georgia. Her son James was born on an Air Force base in Japan. In Hawaii, Claire and her son lived for two years while James served in Viet Nam. As she got older, she loved music; big band, 30's and 40's pop songs, and Elvis. Even when she wasn't speaking much anymore, she would sing, and dance with a big smile on her face. She had given up on being a grandmother until Cassidy and Rory came along. They were a guaranteed way to get a smile on her face. And she always enjoyed a visit with her daughter in-law, Kris, which gave her a reason to look at Jim and roll her eyes. Ella and James would attend church in Atlanta almost every week, partly because James was head usher for years. Together they volunteered at a local food pantry, the Toco Hills Community Alliance; to the point that the volunteer of the year award was named after them. Ella was fiercely dedicated to her family: her husband James, her son James (Kris), her nieces and her mother. She tried to take care of everyone, sometimes whether they wanted it or not! She didn't suffer fools gladly, but most fools would never know it. She is survived by her beloved son James (Kris); loving grandchildren Cassidy and Rory; several nieces and nephews, and even more grand-nieces and nephews. She is preceded in death by her loving husband James Wesley Gilland; sister June Johnston and her parents Charles and Barbara (nee Cameron) Hunter. Add your thoughts, prayers or a condolence to Ella Claire's guestbook.